Host a party in September and EARN great products. Have $300-$499.99 in sales, earn Cheesy Pizza Warm Dip Mix. Have $500-$699.99 in sales, earn Cheesy Pizza Warm Dip Mix,Spinach & Herb Seasoning, and FREE shipping. Have $700 and up in sales, earn Cheesy Pizza Warm Dip Mix, Spinach & Herb Seasoning, Charcuterie board, and FREE shipping. Parties must be held September 1-30, 2018, closed by October 7, 2018. Are you ready to book your party? Contact me or visit my website. Good day everyone. As many of you know I am also a consultant for Tastefully Simple. Our new Spring and Summer line has launched and we are all extremely excited about it. 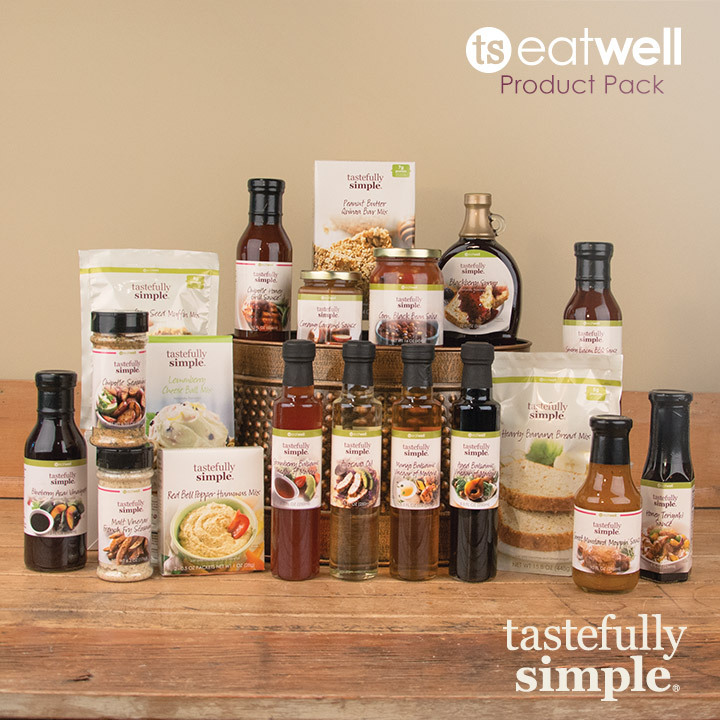 Our TS Eat Well collection has 83 product in it. Each of these products are free from artificial flavors, preservatives, colors, sweeteners, MSG and hydrogenated fats. Eating Well can be simple and delicious. We have a host of new products this season along with some label and name changes for a few others. Over the next few weeks I will introduce you to some TS Eat Well products, some you may know, others you may not. Happy Tuesday everyone! I hope you all enjoyed your weekend. This weeks Taste Test Tuesday is from Tastefully Simple’s standard line. It’s Nana’s Apple Cake. This post does contain affiliate links. If you make a purchase using one of these links I will receive a commission. Did you have guests pop over for a visit? Need a treat for your child’s classroom? Or maybe you just want a quick dessert to go with tonight’s dinner. Nana’s Apple Cake Mix is just the thing for you. Made with just chopped apples and eggs, this sweet cinnamon-spiced cake in ready in just under an hour. If you don’t have any apples on hand, applesauce, pears, peaches, canned pumpkin, pineapples and mandarin oranges work too. You can add walnuts to give it a crunch. Nana’s Apple Cake is a great choice for brunch or even just a snack. It’s a kosher product and makes about 9 servings. You can check out my website for more recipes. Thanks for stopping by today and sure to grab a piece of Nana’s Apple Cake before you leave.